Costa Rican artist Priscilla Monge uses a range of media, including sculpture, installation, performance, and photography, to question established hierarchies and power relations. Monge’s practice allows opposites to sit uncomfortably side by side as she explores notions of love and aggression, often playing with language in the process. In the series The Artist Reveals Mystic Truths, Monge delicately painted teacups that reveal phrases written on the inside rim in coffee, all ending in the phrase “a matter of life and death”. 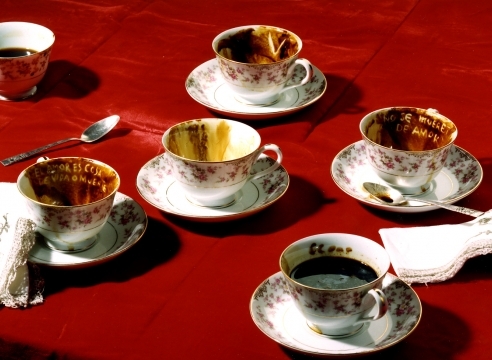 The blood red tablecloth, atop which the teacups are arranged, along with the muddy brown of the coffee, creates an undertone of violence that undermines the overt femininity of the teacups. Here, Monge exposes the brutality that is concealed within daily life, and the fine line that often exists between pain and pleasure. The series Pizarras offers a similar commentary on society’s characterization of “female hysteria”. Sentences such as “I should not have obsessive thoughts”, and “I should not cry”, are written repeatedly on chalkboards, referencing the punishment of a disobedient student as Monge makes these social taboos and prejudices visible. Born in 1968, Priscilla Monge lives and works in San José, Costa Rica. She has participated in the Venice and Liverpool Biennales and her work has been exhibited in numerous international institutions including Museo de Arte y Diseño Contemporaneo, San José, Costa Rica; Museo Nacional Centro de Arte Reina Sofia, Madrid; MoMA PS1, New York; Brooklyn Museum, New York; Museum of Latin American Art, Los Angeles; and Museo de Arte Contemporaneo de Zulia, Venezuela, among others. Monge’s work can be found in numerous major public collections including Museo de Arte y Diseño Contemporaneo, San José, Costa Rica; Tate Modern, London; Museo Nacional Centro de Arte Reina Sofia, Madrid; and Museum of Fine Arts, Taipei.